Perhaps your child just turned 16 and you fear what may occur if he or she is behind the wheel of a new car. Or maybe you want to save several thousand dollars by purchasing a used car. For whatever reason, you have decided to buy a new car in Orange County-well, a new-to-you car, at least. One fear car shoppers can have at times is getting suckered into buying a problematic or lemon car, whether the problems arise from sheer age and mileage or from an accident that the owner "forgot" to tell you about. There are several steps you can take to protect yourself from getting scammed into purchasing a lemon car. When considering a used car, you should first obtain a history report on it from Carfax or another vehicle research company. This report will list all previous owners, accidents, and insurance information. However, we understand that not all minor accidents are reported. Check the bumper and fender for cracks and patched up areas. Repairs to a bumper or fender could indicate possible further damage that may be harder to spot on first inspection. Closely inspect all windows and windshield for webbing, chips or cracks, which could be a sign of additional damage to that area, or at the very least that you'll need to replace the glass. Squat down at one end of the car so that you can peer down the side body along the main line. Distorted reflections or an uneven line could indicate that body panels have been damaged or altered in some fashion. With 30 years of experience in collision repair, skilled technicians at Precision Collision know how to spot cover up work. 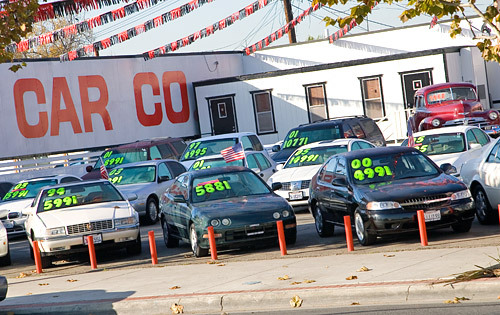 If you are unsure about a potential used car, please call us at 714-997-5050 for the staff to inspect any potential buys.